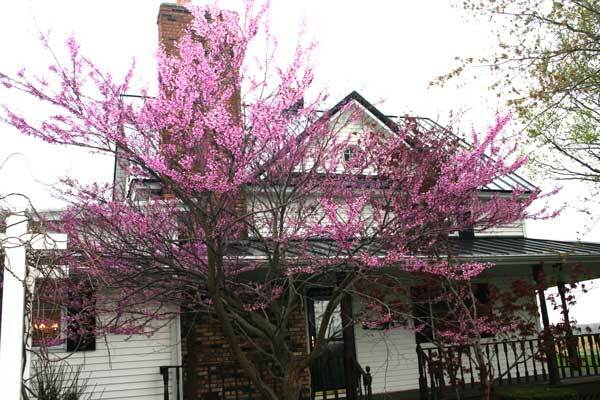 My favorite time of year is spring and I love Redbud trees. Mine is blooming at it's peak right now. I sure wish it would stay this way all summer. But then, I guess we wouldn't have anything to look forward to each year. Isn't it beautiful? What is your favorite season and what is your favorite tree? I LOVE redbud trees (don't have any) and yours is gorgeous!! The white dogwoods are my favorite. We are about to help our 17 1/2 year old dog to cross over, and it is a dragging feeling as we near the date (this Friday) -- I know that whenever I see these trees I will think of this time of year and of her. the spring to make me feel "alive". Joan - Rosebud trees are my favaorite too. About 5 years ago we were driving through Virginia and saw these beautiful trees along I 81 and didn't know what they were so we stopped at a restaurant and asked. We went again the following spring and when we got home immediately planted a rosebud. They are absolutely beautiful. Thanks for sharing.